Rattle weed (Astragalus canadensis) of the Pea (Fabaceae) family, occurs throughout the US except for Arizona, Florida and the far Northeast. It is also found throughout Canada. 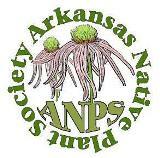 In Arkansas, rattle weed occurs in scattered counties across the state, with most occurrences in the Interior Highlands of the northwestern half of the state. Also known as Canadian milk vetch, rattle weed is an herbaceous perennial. It is found in sunny and wet to somewhat dry prairies, open woodlands, roadsides, thickets and stream banks. The plant has shallow, widely branched near-surface roots. Spring growth sprouts at numerous points along the roots. 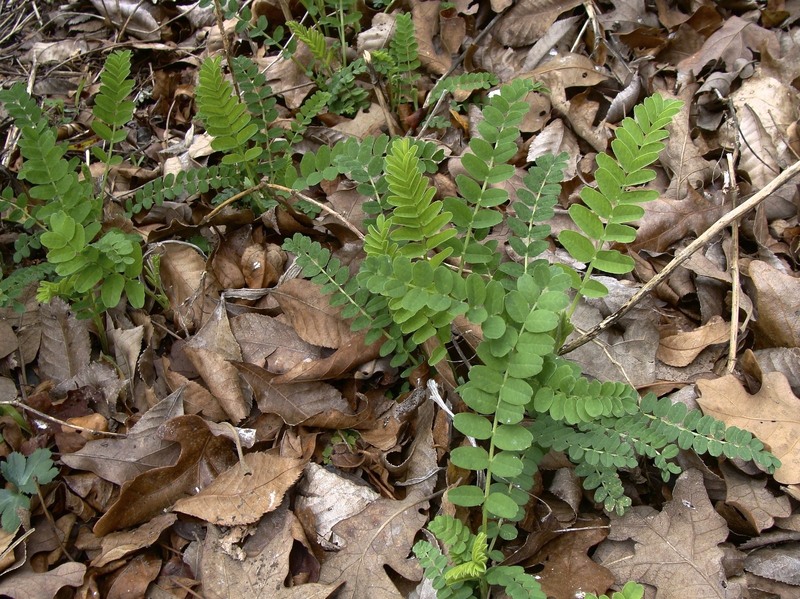 Early leaves develop from erect, light green stems that eventually grow to 1½ – 4 feet tall. Plants in strong sun may develop reddish stems. The plant’s long slender stems, which have similar girth from ground to inflorescence, may recline later in the growing season. The stems are hollow and somewhat square in cross-section, with minor ridging all around. Secondary stems arise from leaf axils, and leaf scars occur all around the stems. The stems may be smooth or pubescent. Photo 1: New stems of rattle weed emerge in early spring from various points along branched roots. With age, colonies may form. 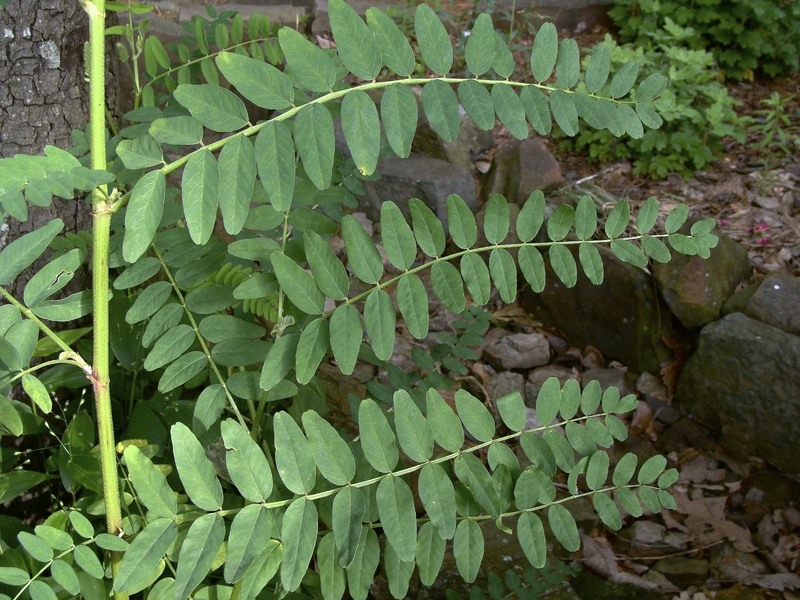 Medium-green, odd-pinnate compound leaves may be a foot long with up to about 31 widely spaced leaflets. Opposite (mostly) leaflets decrease in size towards leaf tips. Insignificant stipules are triangular and pointed. The rachis is grooved along its upper length. The smoothed-edged, oblong to elliptic leaflets on short petiolules are up to about 1½ inches long and ¾ inch wide, with rounded bases and rounded to emarginate tips. Leaflets are generally smooth or slightly hairy on upper surfaces, with stiff short hairs on lower surfaces. Photo 2: Ten-inch mid-stem leaves of rattle weed in late spring. Leaflets are normally opposite, but may occasionally be alternate (see upper leaf). The inflorescence of rattle weed, occurring in late spring, consists of multiple upright racemes of densely clustered white to pale greenish-yellow, pea-shaped flowers which grow from axils of upper leaves along primary and secondary stems. Racemes, on long stems (peduncles), have an elongated cone shape with 50 to 120 or more flowers whorled evenly all around the upper two-thirds of the stem. 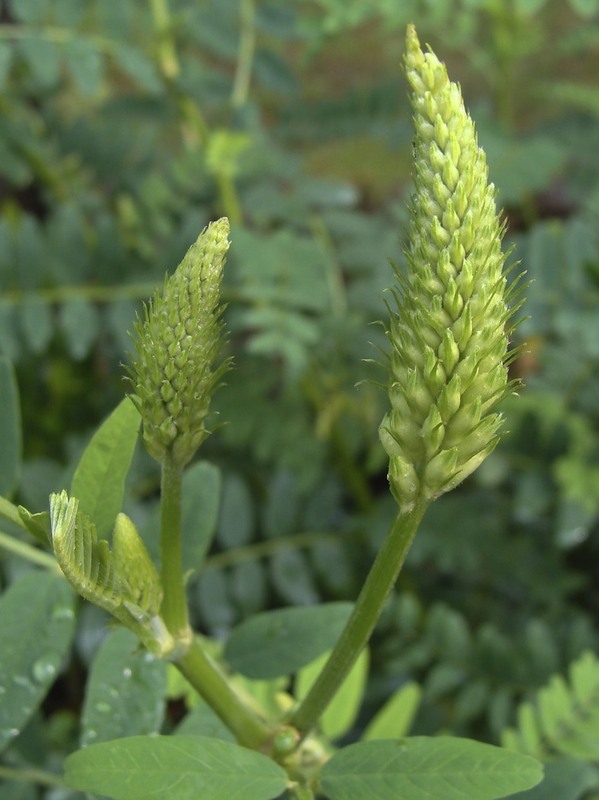 Each flower bud is subtended by a bract which withers as the flower opens. Raceme and stem combined are up to 7 inches long. Photo 3: Raceme with flower buds inclined upward. Each bud is subtended by a bract. Flowers of rattle weed open in succession from the bases of the racemes to tops. Open flowers toward the bottom of the racemes tilt downward while higher flowers are horizontal and then tilted upward. Flowers, ½ to ¾ inch long with a greenish-white, hairy calyx with five triangular pointed lobes, have a tubular corolla composed of five creamy greenish-white petals. The flowers are pea-like and elongated with a petal forming the upper banner, two lateral petals and with two petals forming the keel. The stamens, pistil and style are enclosed by the keel. Photo 4: Rattle weed racemes grow from multiple leaf axils near tops of long, slender stems. Flowers are replaced by inflated, smooth and oval green pods with long pointed tips. The pods, about ½ to ¾ inch long, become dark brown and woody in texture with maturity. The dozen or so seeds in a dry pod become loose and rattle when stems are shaken, thus the common name “rattle weed.” The pods are persistent. Photo 5: Maturing seed pods. All flowers do not produce seed. 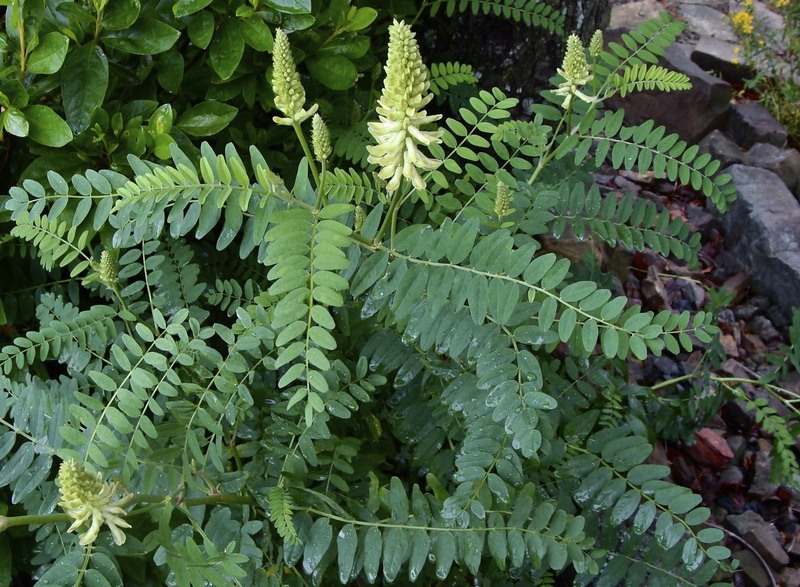 Rattle weed, as a fairly tall specimen plant, can be a good garden plant. Its compound leaves add textural variety and multiple attractive flower clusters are born at the top of the plant. It is not known to be aggressive either from seed or root. The nectar is used by various butterflies and other insects. Seeds are eaten by song birds and turkey. The foliage may be eaten by deer and other herbivores. 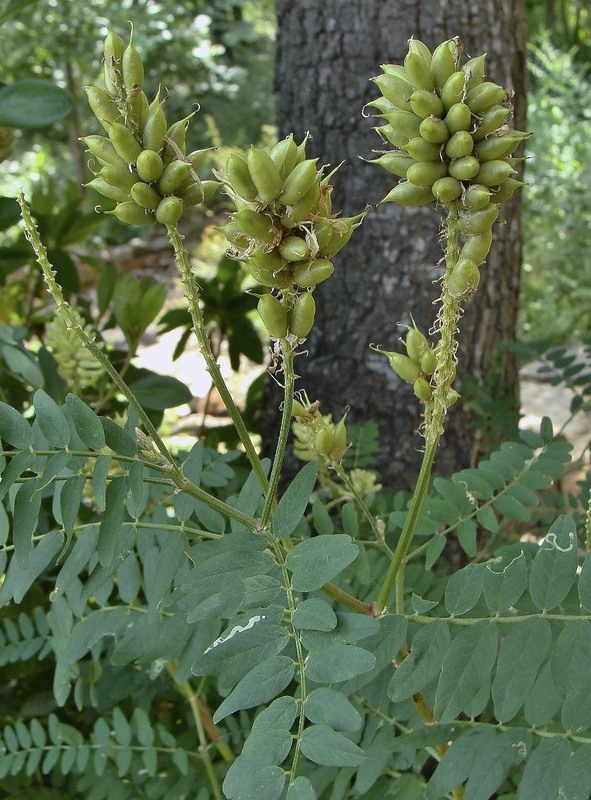 This entry was posted in Know Your Natives, Native Plants, Wildflowers and tagged Astragalus, Astragalus canadensis, Fabaceae, Know Your Natives, Rattle Weed. Bookmark the permalink.